3rd December is the International Day of Persons with Disabilities. This year’s theme is: Removing barriers to create an inclusive and accessible society for all. The Internet Society’s guiding principle is that the “Internet is for Everyone”. This includes the estimated one billion people with disabilities across the world. As communities everywhere celebrate the struggles and achievements of people with disabilities, we would to highlight our paper below: “Internet use by persons with disabilities: Moving forwards”. Through this paper, the Internet Society wishes to expand our work with everyone in the Internet community to improving persons with disabilities’ access to the Internet. If the appropriate Internet tools are available, people with disability can participate equally in society and make substantial contributions to economic and social development. The Internet offers an opportunity for inclusiveness – to view the global community of its users as one while recognising its rich diversity. Internet technologies have the potential to give persons with disabilities the means to live on a more equitable basis within the global community in a manner that previously was not possible. This paper offers policymakers guidance on both why and how to increase use of the Internet by persons with disabilities. While web accessibility is a key aspect of usage, the scope of the paper goes further to consider a broader range of Internet products and services. It outlines issues surrounding accessibility, availability and affordability. The paper explores both the business case and the human rights perspective for improved accessibility to the Internet for persons with disabilities. However, there are many other accessibility issues that are beyond this short issues paper. 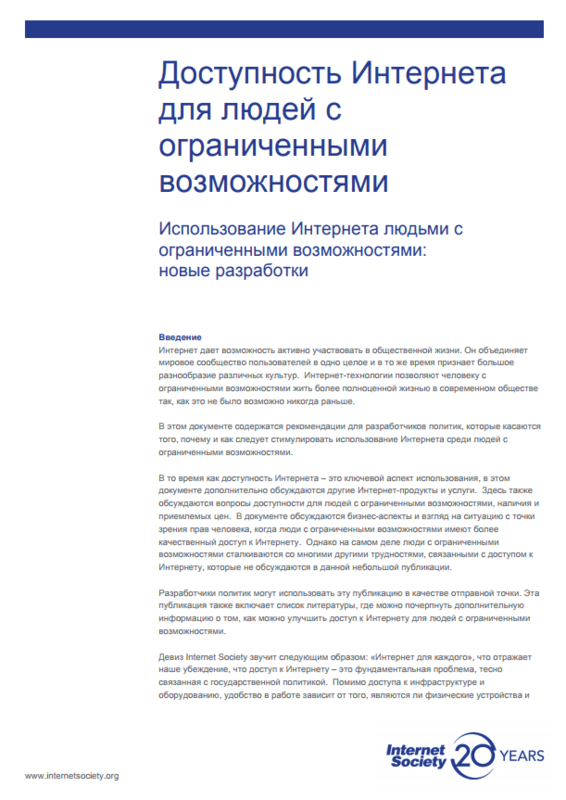 The policymaker can use this paper as a starting point and through the list of references further investigate mechanisms for increasing Internet use by persons with disabilities. The Internet Society’s motto is “The Internet is for Everyone,” reflecting the belief that access to the Internet is a fundamental public policy issue. Apart from access to infrastructure and equipment, accessibility depends on making physical devices and online services useful to everyone, including persons with disabilities. The Internet Society wishes, through this issues paper, to start to expand our work with governments and others in the Internet community to improving persons with disabilities’ access to the Internet. This initiative is in line with some key international drivers towards a more accessible Internet. Persons with disabilities form the world’s largest minority according to the United Nations. One billion people are estimated by the World Health Organisation to have a disability with 80% living in developing countries. Persons with disabilities can equally participate in society and make substantial contributions to the economy if the appropriate Internet tools are available. Over 100 Governments have signed and ratified the UN Convention on the Rights of Persons with Disabilities. Obligations include implementing measures to design, develop, produce and distribute accessible ICT at an early stage, so these become accessible at minimum cost for persons with disabilities. W3C’s Web Content Accessibility Guidelines (WCAG) are increasingly mandated by governments and used by industry to make websites more accessible for people with disabilities. More governments are starting to incorporate accessibility criteria in their public procurement policies. For persons with disabilities, accessibility means being able to use a product or service as effectively as a person without a disability. This means using inclusive design principles to make products and services usable by a wider section of the population. In some cases, this is not possible, and assistive technologies may be called upon to fill the gap. If so, mainstream technologies should enable the software or hardware connection of the assistive device seamlessly, in terms of both interoperability and data portability. Changing peoples’ attitudes to disability is fundamental to achieving greater accessibility. The traditional view of disability is through the medical model, that is, attempting to “fix” or rehabilitate a person to society’s norms. The social model of disability aims to dismantle barriers so that a person with a disability can fully participate in the community. This more contemporary model emphasises a person’s abilities rather than disabilities and encourages a person’s independence and capacity by decreasing environmental barriers. Persons with disabilities face as many different barriers as there are types and degrees of disability. For example, people with a visual impairment who use screen-reading software may be confronted by websites that have confusing navigation, or that lack descriptions of images; while people with a hearing impairment may be unable to participate in online conferencing because it lacks captioning. Through removing barriers, persons with disabilities will be better able to use and contribute to the richness of the Internet by participating independently in the communities of their choice. While making websites accessible is vital, solutions for accessibility are needed to deliver any product or service over the Internet and to accept content or services created by persons with disabilities regardless of the equipment or medium of input. This includes websites, databases, browsers, multimedia applications, mobile phones, computers and their auxiliary equipment. Many persons with disabilities have low incomes and limited educational opportunities. This applies in developed countries and even more in developing countries. Using the Internet is expensive especially in developing countries. When assistive technologies are required, the barrier can be even higher. Persons with disabilities are perceived with pity or shame in many countries. They may be restrictively “protected” by family for any of a number of rationales, ranging from a lack of suitable educational facilities to a lack of appropriate government services. In isolated areas, there may be limited availability of the Internet. Encouraging and meeting the needs of persons with disabilities may be a relatively low priority under such conditions. People in the broader community have limited understanding of how persons with disabilities use technology and of the significant benefits the Internet can bring. Making products and services accessible can therefore mistakenly be considered difficult and costly. The Internet Society together with international bodies, governments, regulators, companies, the technical community and civil society all have roles to play. In particular, governments and policy makers have an important obligation to use the legislative and regulatory tools at their disposal to address accessibility to the Internet for persons with disabilities. The following discussion outlines what is currently happening across all sectors. The United Nations Convention on the Rights of Persons with Disabilities states that access to information and communications technologies and systems is one element that will enable persons with disabilities to participate more fully in all aspects of life. The Convention stipulates that governments take appropriate measures for this to occur. Over 100 countries have signed and ratified the Convention, which brings responsibilities, amongst other obligations, to improve accessibility to the Internet for persons with disabilities. The Convention also states that international cooperation and sharing of resources be done by facilitating access to and sharing of accessible and assistive technologies and through the transfer of technologies. Under the Optional Protocol, there are remedies available to persons with disabilities to file complaints under the UN Convention. 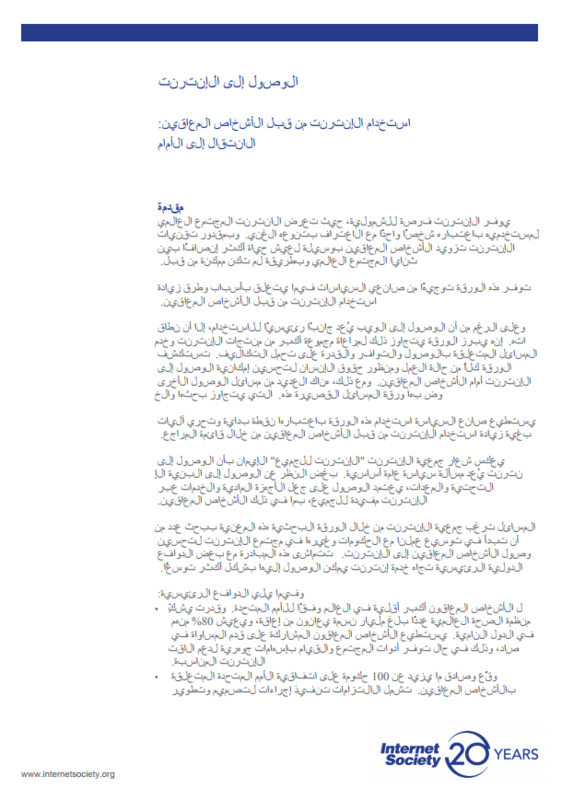 The concluding document from the United Nations World Summit on the Information Society, the Tunis Agenda for the Information Society, states that for equitable access to occur, attention should be given to universal design and promotion of assistive technologies. Universal design or Design for All is the concept of designing products and services for a wider section of the community based on seven key principles. It has the benefit that products incorporating these principles may be more accessible for persons with disabilities. It also means that devices do not have to be retrofitted for accessibility but take that into consideration as part of their original design. The Internet Governance Forum (IGF) recognises accessibility to the Internet as a key issue and through its Dynamic Coalition on Accessibility and Disability has highlighted steps towards an inclusive society. A simple form of inclusion adopted by the IGF itself is the use of real-time captions for its workshop and conference sessions, including online sessions. This is beneficial for persons from non-English speaking backgrounds but vital for persons with hearing impairment. The standards arm of the International Telecommunication Union, the ITU-T, places significant emphasis on accessibility with regard to particular Study Groups, Questions and Recommendations. In 2008, Resolution 70 was accepted at the World Telecommunications Standardization Assembly, highlighting many accessibility standardisation activities including mechanisms intended to ensure that the needs of persons with disabilities are taken into account when developing all ITU standards and guidelines. In addition to International obligations for national governments to increase accessibility for persons with disabilities arising from international instruments, national governments and regulatory authorities are taking action. A number of countries have created or modified general communications legislation to include clauses on accessibility. Other countries have created specific legislation to promote accessibility. For example, the United States has passed the 21st Century Communications and Video Accessibility Act of 2010. In some countries, regulatory authorities may use Universal Service Obligation (USO) funds to assist persons with disabilities. These funds usually cover the costs of providing ICT services in rural and remote regions, but they may also have the capacity to incorporate provisions to fund services for persons with disabilities in all parts of a country. For example, a pilot project using Universal Service Obligation funds has started in India to help persons with disabilities to access ICT in rural communities. Another approach at the national level is to incorporate accessibility criteria in ICT public procurement processes. Doing so encourages companies that tender for supply of hardware and software to governments to offer products that are more accessible for persons with disabilities in order to win contracts. The pioneer of this approach was the US Government, through the Section 508 guidelines for suppliers. The European Union’s Public Procurement Directive includes accessibility criteria, and under Mandate 376 has directed European standards organisations to develop an online toolkit to support government agencies in accessible ICT procurement. The Business Taskforce on Accessible ICT established an Accessible Technology Charter in November 2011. The Charter sets out 10 commitments that corporations should make so that ICT accessibility is embedded throughout the organisation including HR, policy, staff awareness, employee workplace adjustments and procurement. There were 17 launch signatories including Cisco, Fujitsu, Microsoft and Oracle. There is potential for market growth in the disability and aged segments if products and services are accessible and offered at an affordable price. In Japan, as in many developed countries, the mobile phone market is saturated except for those over 50. As people age, they may have hearing loss, vision loss or arthritis and will need more accessible features. NTT has successfully sold 14 million Raku Raku phones designed for the older age brackets. Those handsets are more generally popular because of their user-friendly features. In Australia, organisations are encouraged to develop a Disability Action Plan detailing activities and timeframes. These plans are lodged with the Human Rights Commission, and indicate a public commitment to improve accessibility. Telstra, Australia’s largest ISP and telco, was the first corporation to develop one of these plans. Companies such as Microsoft and Apple now have progressive attitudes to accessibility. This has come about in part as a result of both a “carrot” and “stick” approach in USA. Firstly, the US Government incorporates accessibility criteria in its public procurement policy (through what are called Section 508 guidelines) thus stimulating industry to supply more accessible products to its agencies. Secondly, litigation under discrimination and telecommunications legislation has focused companies’ attention on the possible consequences if accessibility needs are not appropriately addressed. Many Microsoft and Apple products and services are now designed to be accessible right from the start. For example, the iPhone is popular with blind people who can use the device “out of the box” without the need for assistive add-ons. As another example, YouTube offers an auto-captioning feature to make it easier to caption videos. This may even be considered as a revenue source where videos can be indexed and thus be more available for advertisers. These are positive developments; but there needs to be ongoing vigilance. Without ongoing efforts to raise awareness, new types of products may create new barriers. There are new potential technical solutions that can benefit both persons with disabilities and the general community. Products like speech recognition (originally designed for people with limited hand movements) and the scanner (designed as part of a document reading device coupled with speech synthesis for blind people) are now mass market products. The Internet Engineering Task Force (IETF) has developed real-time text specifications as a framework document. Real-time text enables Deaf people and persons with hearing impairment to communicate by text in real time in a way similar to a voice conversation. Further to that, Total Conversation incorporates voice, text and video to ensure that persons who are Deaf, have a hearing impairment or who are deaf-blind can engage in a phone conversation that meets their needs. This has also been described by the IETF. Other standards bodies are engaged in developing similar standards to enhance accessibility. While technical standards can be developed to meet a particular disability need, it is just as important to consider any impact on disability at all stages in the development of general technical standards. Creating accessibility guidelines and consultation with disability experts are two methods of achieving the needed awareness. 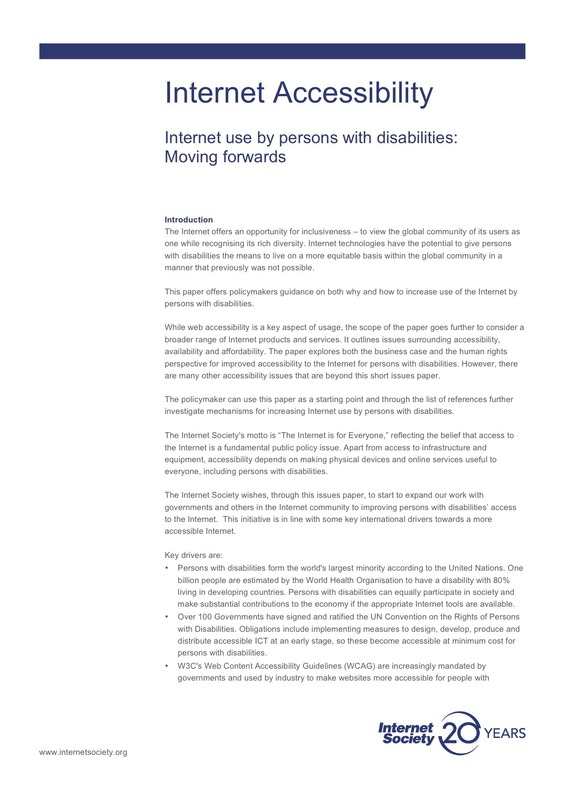 The Internet Society’s initiative on Enabling Access, amongst other things, moves to “advance the development of technologies and the business case for facilitating the use of the Internet by people with disabilities”. There are internationally recognised accessibility guidelines developed by W3C on web content, authoring tools and user agents. These guidelines, especially the Web Content Accessibility Guidelines (WCAG), are used by many governments to build accessible websites. Version 2 of WCAG stipulates that websites are to ‘perceivable’, ‘operable’, ‘understandable’ and ‘robust’. The guidelines detail how this is done under three levels of success criteria. Cloud computing has massive potential to deliver affordable and accessible services to persons with disabilities. To take one example: interoperability between assistive technologies and mainstream products has been a barrier that may be overcome through a cloud-based initiative, the Global Public Inclusive Infrastructure project. This hopes to offer the user the ability “to invoke and use the access features they need anywhere, anytime, on any device.” It has the potential to significantly reduce the costs of assistive technologies for persons with disabilities across the world and especially in developing countries. The GPII is a project of Raising the Floor, which has attracted several high-profile supporters, including Vint Cerf and major technology companies. “Nothing about us without us” is the motto of the disability movement. Disability organisations should be involved in any policy or program development and can offer valuable input based on the representatives’ lived experience of disability. Examples of key organisations are the World Blind Union and the World Federation of the Deaf. Regardless of our individual or organizational role, we can all play our part in helping to increase and enhance the ability of persons with disabilities to use the Internet. Below are examples of activities that will help to make a difference. Some are achievable only through high-level policy directions, while others are more practical. Each individual action contributes to the whole to make Internet products and services more accessible and more useful for persons with disabilities and others in the general population. Stimulate the development of technologies that enhance usability for persons with disabilities by, for example, taking into consideration Universal Design principles. Learn more about the W3C’s Web Accessibility Initiative and make use of its accessibility guidelines on web accessibility, authoring tools and user agents. Encourage your governments to abide by the Articles in the UN Convention on the Rights of Persons with Disabilities if they have signed and ratified the Convention. If your governments have not yet signed or ratified, we can encourage them to do so. Support the Global Public Inclusive Infrastructure initiative to enhance interoperability between network systems and assistive technologies. Ensure that accessibility is embedded in your organisation’s mission statement and is supported at a senior management level. When developing technical standards and guidelines, consider using objective criteria to determine whether there is an impact on persons with disabilities. Include disability representatives on working committees where there may be an impact or potential benefit. If tendering for the supply of software or hardware, learn whether there are any accessibility features and list them in the tender documents. If you are a decision maker in a corporation, become a signatory to the Business Taskforce on Accessible ICT’s Accessible Technology Charter. Develop a Disability Action Plan for your organisation, whether governmental, non-profit or corporate with an implementation plan and assigned responsibilities across all sectors of the organisation. Consult on an ongoing basis with disability experts and representatives from disability organisations who have the lived experience of disability. Organise disability awareness training within your organisation. • Seek out and make use of accessibility guidelines when planning meetings and conferences, whether face-to-face or online. This includes the provision of real-time captioning. • Use accessibility guidelines when developing communications materials such as ensuring that videos are captioned, and using user-friendly fonts and colours in printed material. This issues paper offers examples of what is being done across sectors and what the Internet community can do to increase and enhance the use of the Internet by persons with disabilities. Regardless of the challenges they may face, persons with disabilities can contribute to society like any other member of the community when barriers are removed. Increasing accessibility to the Internet can help to make that happen. Governments, industry and other key stakeholders need to make accessibility a priority in their ongoing work, individually and collaboratively. 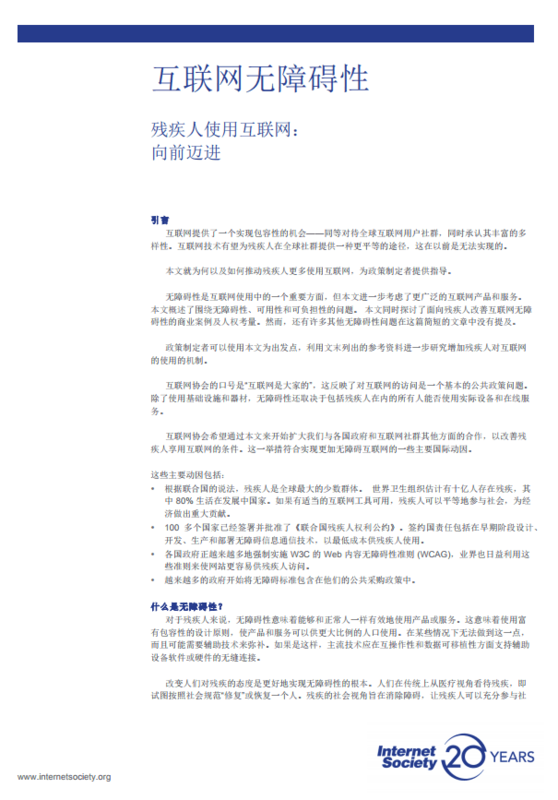 This issues paper is intended as a starting point for the Internet community to work together to make change for both social and economic benefit. If we are to be successful we must commit to move forwards and make a difference, together. The Internet Society is guided by the belief that for an Internet to exist for the good of all people, it must be shaped by diversity, inclusion, and equality.